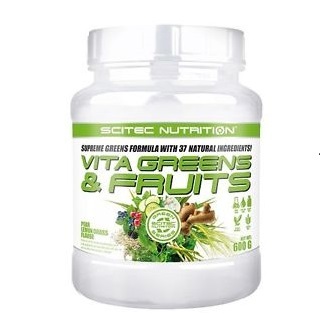 Vita Greens and Fruits by Scitec is a premium greens formula with an abundant of natural ingredients, minerals and vitamins. Minerals and vitamins are vital nutrients that must be taken to optimise health and promote high level sports performance. Many people struggle getting the recommended greens in daily due to their busy schedule and that is why Vita Greens and Fruits by Scitec is the ultimate answer in meeting your daily recommended intake of greens as this product is super convenient and easy to digest. 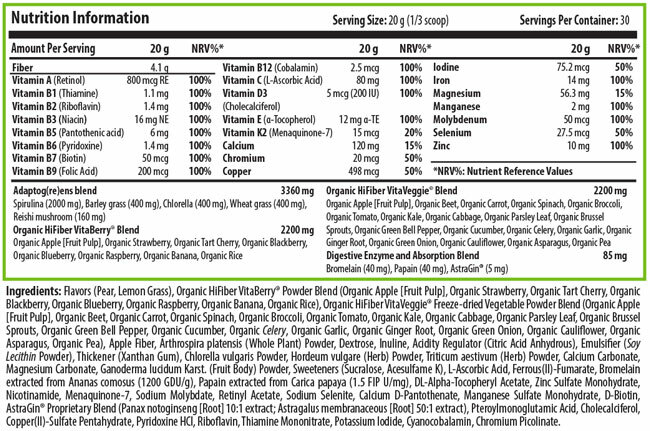 Vita Greens and Fruits by Scitec contains 18 different vegetable and 8 different sources of fruit in just one serving! However, the benefits of Vita Greens and Fruits does not stop here, it also contains a good dose of adaptogen plants such as wheat grass and spirulina to help assist in controlling weight as it suppresses hunger. Also, Rheishi mushroom is an ingredient in Vita Greens and Fruits as this ingredient aids in natural immunological defences. There is no better way to enjoy your greens than Vita Greens and Fruits by Scitec as this product offers convenience and quality at your fingertips! Your body will definitely thank you for it! Manufacturer recommends to mix 1 serving (20g) with 300 ml water daily. Use 30 minutes before a meal. Not intended as a sole source of nutrition.